As we enter the second season of the Amherst Irish Association’s Events Series, a community-based initiative whose aim is to host monthly events that explore aspects of Ireland’s diaspora, culture and society, we acknowledge the support of our local community. 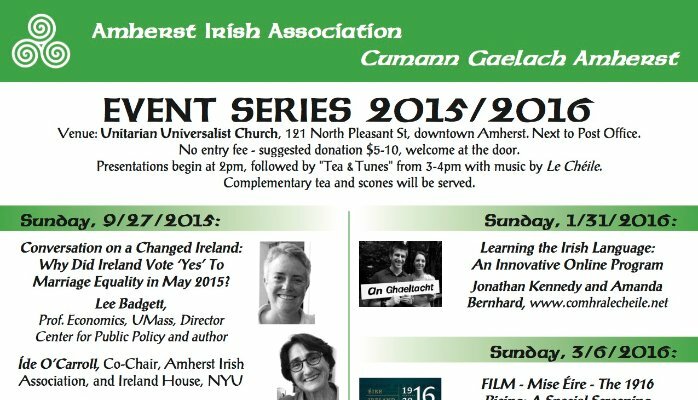 The Amherst Irish Association/Cumann Gaelach Amherstgrew out a connection between people in our community with a shared pride in Ireland’s cultural heritage – mórtas cine. In March 2014, just before Spring Break and St. Patrick’s day, the small New England town of Amherst hit the national news in the USA and in Ireland. The images carried were of violent and drunken episodes as hundreds of students involved in the annual “Blarney Blowout” took to the streets and the police seemed to lose control (www.masslive.com/…/2014/…/blarney_blowout_arrest_u…). The “Blarney Blowout” was the main event associated with Ireland in Amherst, Massachusetts. No matter how many people argued that the “Blarney Blowout” had nothing to do with Ireland, or being Irish, what was undeniable was that police in riot gear were seen to disperse crowds of students many wearing green T-shirts with slogans about Ireland and drinking. Those of us of Irish heritage living in the town agreed that rather than attempt to influence something over which we had little or no power, we needed to be proactive, to create something that offered the town of Amherst, and the wider Pioneer Valley community, a different set of associations to Ireland. We sought out others in our community interested in exploring links to aspects of Ireland’s rich history and culture, its politics, economy, business connections, and indeed, its changing society. We put the word out via local newspapers and social media and were pleasantly surprised by the positive response. In Boston Globecolumnist and Pulitizer-prise winning journalist, Kevin Cullen, we found a champion, someone who attended UMass Amherst as an undergraduate, a man with a proven understanding of the complexity of what it means to be Irish in America. Kevin kindly agreed to kick-start our Amherst Irish Association Event Series on February 1st, 2015. With a Core Team of five members (Sam Hannigan & Íde O’Carroll, Co-Chairs; Derek Pyle, Fundraising; Antonia Moore, PR, and Tim Goodhind, Treasurer and Webmaster), and a host of other volunteers (Jim Wald, Pam Tinto, Rosie Caine, Anna Mundow, Annie Rogers), we successfully organized and delivered our pilot program in 2015 (see our website www.amherstirish.org). Members of the team and those who attend our events represent different generations of Irish heritage in our community – people whose families emigrated to America a long time ago and some Irish-born. In planning our program, we respond to this intergenerational mix by offering topics relating to Ireland’s past and present. For example, one event concerned the emigration of the Blasket Island people to nearby Springfield, Massachusetts (a presentation delivered by a direct descendent), while another event focused on the complexities of Ireland’s economic boom, bust and recovery (delivered by a member of the Irish government’s Fiscal Council). We invited members of our community to introduce the speakers (including our esteemed Consul General in Boston, Breandán Ó Caollaí), thereby widening the scope of involvement locally, and hosted local musicians at each event. Our Core Team ranged in age from 23 (two members were recent graduates of local colleges) to late 50s (three members). With the help of friends and family, we promoted the events within our social networks and disseminated specially designed flyers and posters. Approximately 50-60 people attended each of the events at the Unitarian Social Room in downtown Amherst. The suggested donation was $5-10. Presentations began at 2pm, followed by “Tea & Tunes,” a time when participants continued the discussion (over complimentary tea and scones) while local musicians performed. Participants were also invited to join the association ($25 individual, $100 business, $10 student). In a demonstration of solidarity with the association and its mission, the Town of Amherst designated 1st February, Brigid’s Day as Irish Day in the town. On our website you’ll see a copy of the proclamation which cites the contribution of Irish emigrants past and present to the commercial, cultural and educational aspects of town life. Our 2015/2016 program has been expanded to eight superb events (see flyer above) and runs from September 2015 to May 2016. Our approach is informed by the lessons learned during our review. Our kick-starter event is a discussion of Ireland’s recent Marriage Equality referendum result with Lee Badgett, an internationally-recognised specialist in this area. Other presentations include the importance of Irish maids in the life of poet Emily Dickinson and scarcity as a theme in the poetry of Lady Wilde (literature); a new musical composed by Rosemary Caine on Joyce’s women; a special screening ofMise Éire, the classic film on Ireland’s 1916 Rising and later, a how-to presentation on tracing Irish ancestry (history). We are especially pleased to host Jonathan Kennedy and Amanda Bernhard (January 2016) who will discuss their innovative online Irish language program,www.comhralecheile.net. This young couple, both of whom studied for Masters’ degrees in Modern Irish at NUI Galway, are fourth-generation Irish-Americans who combine technological know-how with a passion for the Irish language to promote its usage amongst the diaspora. The Amherst Irish Association uses traditional promotional materials to target the “older” generation and social media to target younger people. This inter-generational mission is at the heart of our work to build our connection to people in the area with a shared interest in Irish heritage. Come join us! Bígí linn! This entry was posted in events, Irish Language. Bookmark the permalink.